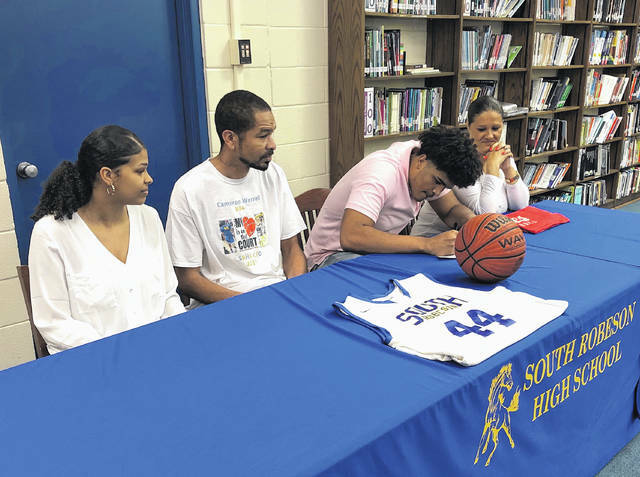 Jonathan Bym | The Robesonian South Robeson’s Cameron Werrell signs his letter of intent to play basketball at Louisburg College on Friday, joined his parents, Isaac and Melissa, and sister, Hailey. ROWLAND — To help make him a college basketball caliber player, South Robeson’s Cameron Werrell said it took dedication to fulfill a lifelong dream. After posting a breakout year this past season as a senior, Werrell was able to cash in his hard work by signing with Louisburg College on Friday. Werrell’s dedication to get better was not just skill wise, but physically. The 6-foot-6 athletic big man is the second Mustang to sign to play college basketball since Jarurias Davis last year, and Werrell said that motivation from him helped propel him before his senior season to better himself. Playing on the blacktop is where Werrell fostered his love for the game at a young age playing against his father, Isaac, who is also tall in stature. That’s where Werrell learned to play among bigger defenders, until he became the biggest player on the floor. Werrell earned Robeson County boys basketball Player of the Year honors this season and was a dominant force on the floor for the Mustangs. He averaged a team-high 19 points and 11 rebounds a game, and was the team’s leading 3-point threat, hitting 31 this season. South Robeson coach Ryan Bullard said that kind of output came when Werrell improved his conditioning to start a domino effect with his game. Louisburg was one of many junior colleges that started giving attention to Werrell over his senior season. He said the feel of the program was the most comfortable. The Hurricanes finished 15-16 last season, and are two years removed from a 28-6 campaign in 2017-2018 where they won the Region X tournament. Werrell’s goal after Louisburg is to continue to play basketball at the Division I level. 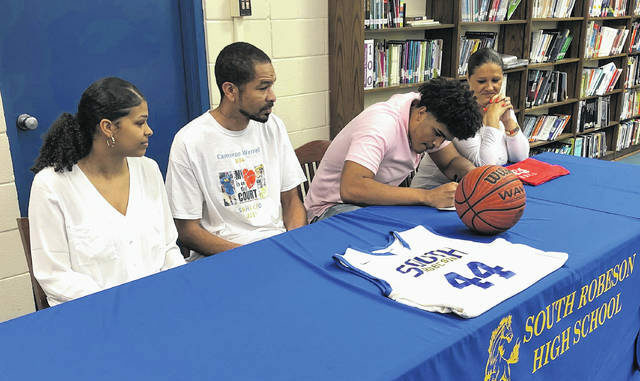 https://www.robesonian.com/wp-content/uploads/2019/04/web1_file-43.jpegJonathan Bym | The Robesonian South Robeson’s Cameron Werrell signs his letter of intent to play basketball at Louisburg College on Friday, joined his parents, Isaac and Melissa, and sister, Hailey. Jonathan Bym can be reached at 910-816-1977 or by email at [email protected] Follow him on Twitter @Jonathan_Bym.